The S3 chair was a custom design by Alfred Hendrickx for the first class lounge of Sabena Airlines in Brussels, 1958. 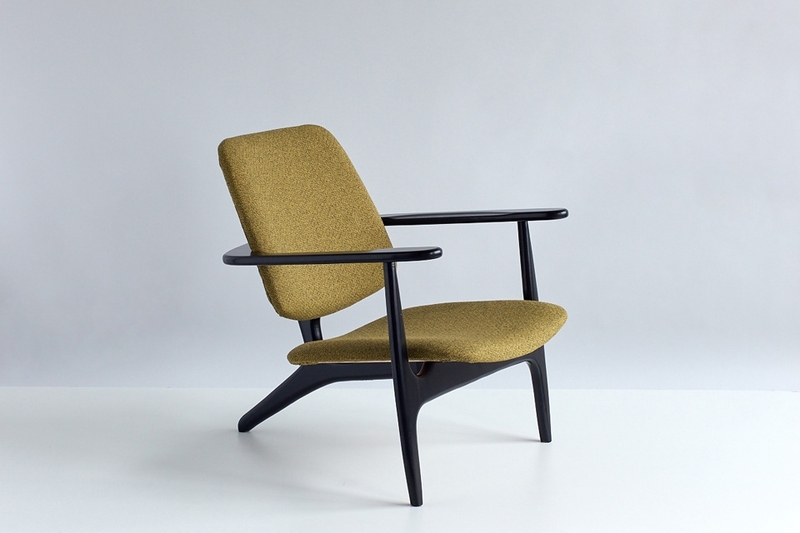 The three-legged beauty is a stunning example of modernist design with streamline influences.The production was limited to three colors of tweed upholstery: mustard, cranberry and sky blue. Only 50 chairs per color were produced, of which very few remain. The chair on offer is in its original mustard upholstery and in excellent condition. Biography: Alfred Hendrickx (1931-) was one of the prominent Belgian designers of the midcentury era, known for his original designs with an elegance that displays a somewhat Italian sensibility. Hendrickx distinctively stood out with his designs for Belform, which were stylistically related to the organic and sculptural lines presented in the work of renowned Italian designers and architects of the time such as Gio Ponti and Ico Parisi.